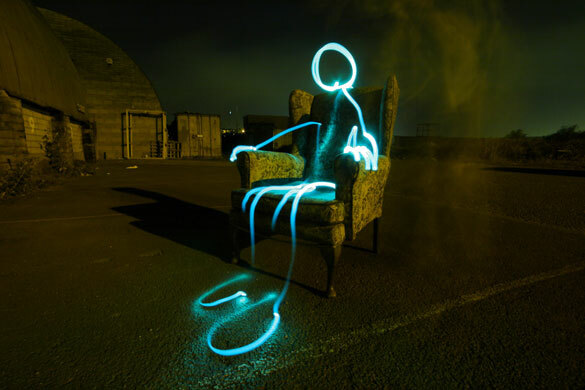 Light Graffiti Is A Simple Form Of Art Using Photographic Techniques. Light Graffiti Is Made From Different Types Of Light Sources And Time Lapse Photography. This New Trend To Art Uses The Movement Of Light To Create Awesome Pictures And Is Usually Created On The Streets, Inside Darkrooms And Also At Artists Studio. Here Are Some Few Inspirational Example Of Light Graffiti. 1. First Night With The Black Light Flashlight And The New Line-making Device. 11 Why Are You Wearing That Stupid Man Suit? Please Leave Your Thoughts About This Inspirational Light Graffiti.